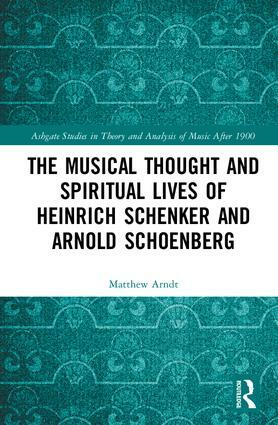 This book examines the origin, content, and development of the musical thought of Heinrich Schenker and Arnold Schoenberg. One of the premises is that Schenker’s and Schoenberg’s inner musical lives are inseparable from their inner spiritual lives. Curiously, Schenker and Schoenberg start out in much the same musical-spiritual place, yet musically they split while spiritually they grow closer. The reception of Schenker’s and Schoenberg’s work has sidestepped this paradox of commonality and conflict, instead choosing to universalize and amplify their conflict. Bringing to light a trove of unpublished material, Arndt argues that Schenker’s and Schoenberg’s conflict is a reflection of tensions within their musical and spiritual ideas. They share a particular conception of the tone as an ideal sound realized in the spiritual eye of the genius. The tensions inherent in this largely psychological and material notion of the tone and this largely metaphysical notion of the genius shape both their musical divergence on the logical (technical) level in theory and composition, including their advocacy of the Ursatz versus twelvetone composition, and their spiritual convergence, including their embrace of Judaism. These findings shed new light on the musical and philosophical worlds of Schenker and Schoenberg and on the profound artistic and spiritual questions with which they grapple. Matthew Arndt, Associate Professor of Music Theory at the University of Iowa, holds a PhD from the University of Wisconsin·Madison, an MM from the University of Colorado at Boulder, and a BA with honors from Lewis & Clark College. He has previously taught at Mercer University, Lawrence University, and the University of Wisconsin·Madison. Professor Arndt primarily studies the application of insights from the history of music theory to music theory pedagogy, analysis, and criticism. He also studies technical aspects of sacred music from the Republic of Georgia.